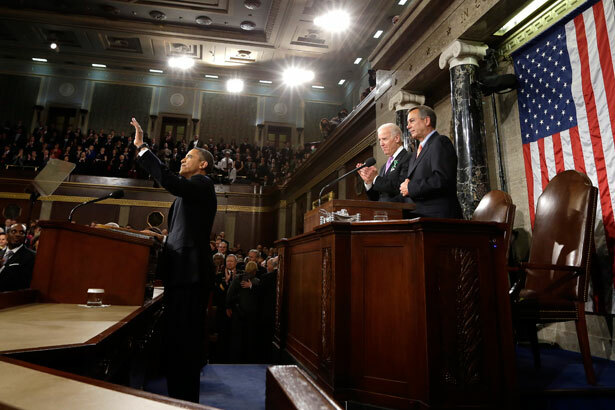 Some undocumented immigrants expected more on immigration from Obama’s State of the Nation speech. But we didn’t hear anything new in terms of comprehensive immigration reform. Obama touted increased border security, but failed to mention the record number of deportations that continue to occur under his watch. The president did reiterate his call for a pathway to citizenship, but only when followed by a background check, fees and fines, and English language acquisition. Some of those restrictions might stand in the way of undocumented immigrant workers who labor long days with little pay, and little access to time or the educational opportunities that would allow them to learn English. Tonight’s audience included at least five young undocumented immigrants, most of whom qualify for Obama’s Deferred Action for Childhood Arrivals plan, or DACA. These “dacamented” students included current college students and recent graduates. Julieta Garibay, who founded United We Dream, could have been one of them. The activists has organized around the DREAM Act for years, but at 32 years old, she just missed the age cut off. Garibay represents the toll that the arbitrary nature of a broken immigration system takes. Obama’s remarks didn’t sit well with Miguel Guerra. The 37-year-old construction worker and father of three was arrested last summer for protesting against Sheriff Joe Arpaio in an action organized by Puente. His oldest daughter also just became “dacamented” under Obama’s plan—and two of his other children are US citizens, both born in Arizona. After his arrest, Guerra was taken to a local jail before an immigration hold placed him in detention an additional day. He was released on bond, and is fighting his deportation, with a court date for December. In the meantime, he has a worker’s permit and driver’s license—but his future remains uncertain. His wife, a domestic worker, currently has no documentation. Their family represents so many that remain split by a jumbled collection of rules, directives and legislation that may stand to tear them apart: a father with permission to be in the country until at least the end of the year, an undocumented mother, a daughter with authorization for at least two years and two US citizen children. Guerra said he was disappointed with Obama—he was hoping the president would announce a halt to deportations that could split families like his apart at any moment. “This isn’t just for me, but for all families, for the whole country,” he explained from Washington, DC, where he traveled with a delegation of more than 250 workers who will attend tomorrow’s Senate hearing on immigration. The hearing will include remarks from a range of panelists, including Pulitzer Prize–winning journalist turned undocumented activist Jose Antonio Vargas. Read Aura Bogado's report on last week's congressional hearing on immigration reform.